For too long people have thought of kaizen as something that leads to job loss. Let’s turn that around and think of kaizen as job security. Computers cannot identify what needs to be improved. They cannot do kaizen, only people can. That gives us humans a big advantage over computers – maybe not forever, but for a long time to come. And kaizen must be local to achieve rapid response. It can’t be outsourced. 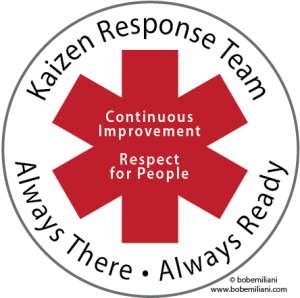 Kaizen teams are valued first responders to business problems. Tempted though managers may be to eliminate as many people as possible, doing so would be unwise because people can respond to changing circumstances more rapidly than software or robots. While it may not make much economic sense from a cost perspective to reserve unused productive capacity just-in-case, successful organizations will do just that with people. They will have reserve human capacity to do kaizen every day and to rapidly respond to changing circumstances because it makes economic sense from a revenue perspective. It is true that most leaders will follow the herd and replace people with computers and robots, but they will learn that the company’s inflexibility is more a liability than it is an asset. Customers want the people and organizations they buy from to be flexible, not inflexible. That capability will become an increasingly important source of competitive advantage in every marketplace – but only if the executive view of kaizen changes from cost-cutting to sales growth. Because of its role as a fundamental differentiator between humans and machines, kaizen will gain increasing importance in the workplace over time. Kaizen could turn out to be the best job for humans. There is one looming problem, however. As leaders automate more business processes, kaizen will be less valuable as a means for process improvement. Automating business processes also means that larger numbers of employees will likely work from home, therefore dispersing the teams whose physical presence is necessary at work in order to do team-based kaizen. It is possible that kaizen, a uniquely human activity, someday becomes a relic of the industrial era, unable to make the transition to the digital era. But that seems unlikely, at least for some time. There will still be people going to work who will need to improve their work processes, as well individuals working from home. Well said, Bob. The best “lean” companies can use both kaizen and automation to eliminate work done by a human being and redeploy that FTE into another aspect of the business. The best companies are able to eliminate FTEs and re-position them to meet the growth demands.